Nothing beats biting into a crispy taco shell that's filled to the brim with this saucy spicy taco meat. Heat a large skillet on medium heat and add the ground beef and ground pork. Stir together. Add chopped onions and stir. Continue stirring and breaking up the ground meat into pieces as it cooks. Cook until the meat starts to turn brown (about 12 minutes). Transfer the meat to a slow cooker pot. In the pot, add granulated garlic, onion powder, oregano, cumin, pepper, salt, chili powder, tomato sauce, water, and hot sauce. Stir together. Cover with a lid and cook on the low setting for 4 hours. After it's done cooking stir together. 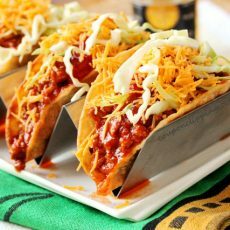 Serve the taco meat while hot in crispy taco shells and top with shredded cheddar cheese and lettuce.